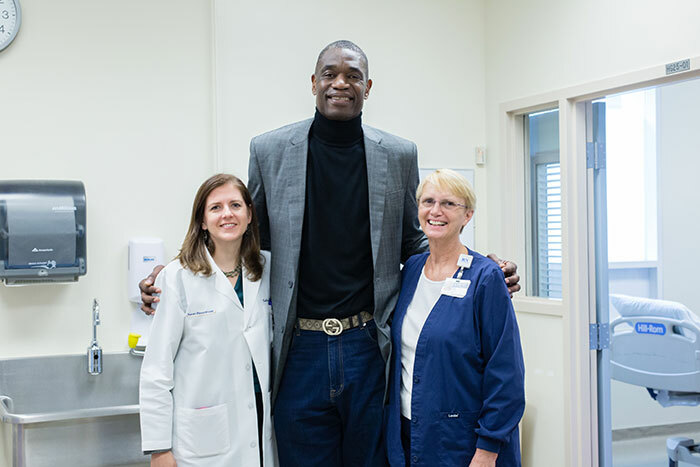 Dikembe Mutombo poses with Emory infectious disease physician Colleen Kraft (left) and critical care nurse Jill Morgan (right) during a visit to the Serious Communicable Diseases Unit. During the Jan. 18 visit, Mutombo was able to try on a PAPR — a powered air-purifying respirator — worn by Emory staff when caring for patients with Ebola virus disease. Mutombo also used headsets to view virtual reality programs created to prepare health care workers for caring for patients with Ebola and other infectious diseases. The Ebola outbreak in the Congo, which began Aug. 1, 2018, now has more than 600 probable victims with nearly 400 deaths and 200 survivors reported by the DRC Ministry of Health. The current Ebola outbreak in the DRC is the second-largest and second-deadliest in history, the first being the outbreak in West Africa in 2014-2016, where Ebola virus disease killed more than 11,000. When NBA Hall of Famer and philanthropist Dikembe Mutombo, a Congolese American who has built a hospital in the Democratic Republic of Congo (DRC), was visiting his homeland recently, he noticed that people weren’t shaking hands with others who came from areas in the DRC where Ebola virus is spreading. “The fear is there, of not knowing who has it or where the risk is,” he said, describing the Congo’s current outbreak, now the second-deadliest in history. 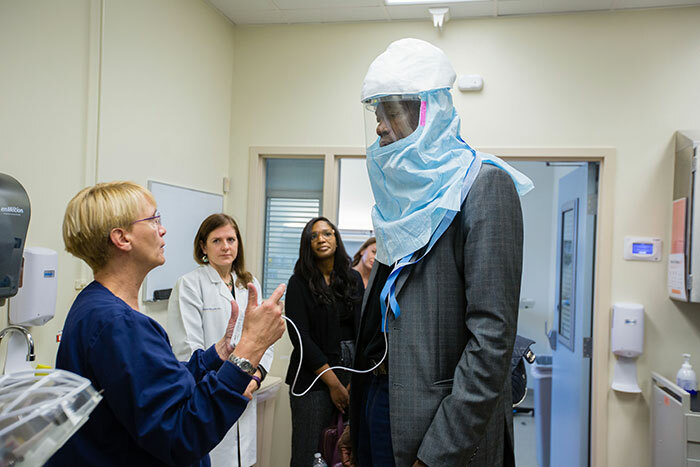 Mutombo, who at 7-foot-2 has to duck under every doorway he encounters, was at Emory University Hospital Jan. 18 to tour the Serious Communicable Diseases Unit (SCDU) and talk with Emory infectious disease experts. Many in the Emory group that met with Mutombo were all too aware of the stigma associated with Ebola virus disease, as they were among the original team of doctors and nurses who helped care for four patients with Ebola virus disease at Emory in 2014, including the first person with the disease treated in the United States. “We are constantly watching the outbreak in the DRC, vigilant about how we can help,” says infectious disease physician Colleen Kraft, the associate medical director of the SCDU and a member of the original Ebola care team. As the group toured the treatment rooms in the negative-pressure isolation unit, Mutombo, his wife, Rose, and Alicia Smith of his philanthropic foundation were especially interested in how the resulting knowledge and skills could be applied globally. Mutombo was able to try on a PAPR — a powered air-purifying respirator — as Morgan coached him on its proper operation. “It’s like having air conditioning on my head,” he said. Morgan agreed, saying this was what the staff loved about it as well. The current SCDU is being expanded to include more isolation rooms (from two to 11) and it contains a larger, permanent clinical laboratory. “The unit will continue to be used to care for patients with serious infectious diseases as well as volunteers undergoing certain clinical trials,” said Kraft. Emory’s efforts to prepare for future outbreaks have been ongoing through research, improved patient-care protocols and training health care workers and first responders domestically. 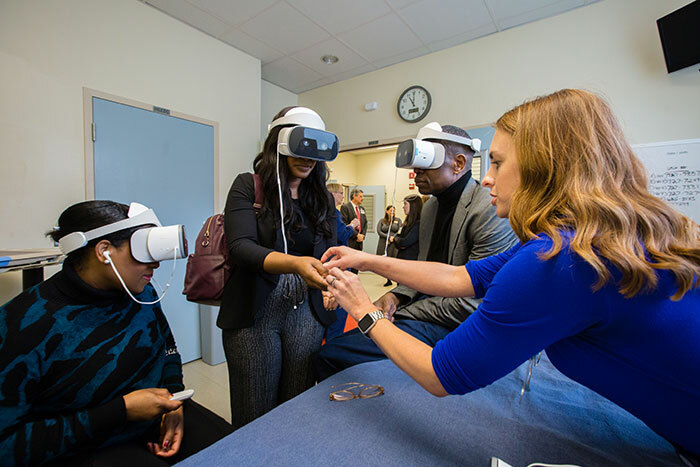 For example, Mutombo and his associates used headsets to view virtual reality programs created with a 360-degree camera by an Emory Libraries and Information Technology Services team with the National Ebola Training and Education Center. The immersive experience is designed to prepare health care workers for caring for patients with Ebola and other infectious diseases. One program simulates helping an ill patient while wearing a somewhat cumbersome Personal Protective Equipment (PPE) suit. “The VR simulation does a really good job of accurately portraying your limited view and dexterity, and how you have to keep your hands in front of you,” said infectious disease physician Aneesh Mehta, who cared for patients with Ebola virus disease at Emory in 2014. Mutombo then toured the clinical laboratory embedded in the SCDU, going over logistics in anticipation of the pathology lab opening at the Biamba Marie Mutombo Hospital (named for his mother), which he built in the DRC in 2007. The Congo is near to Mutombo’s heart, as he was born in the capital city of Kinshasa in the DRC. One of 10 children, he came to the U.S. as a college student on an academic scholarship to attend Georgetown University, where he was quickly recruited for the college’s basketball team. He gained dual degrees in linguistics and diplomacy. Mutombo played pro basketball in the NBA for 18 seasons, including a five-year stint on the Atlanta Hawks from 1996 to 2001, before retiring from the Houston Rockets in 2009. He is widely regarded as one of the best shot blockers of all time. He now spends much of his time on humanitarian concerns through his foundation, with a special interest in health care, and is on the board of the CDC Foundation. The DRC, he said, “represents in many ways the perfect epidemiologic storm” due to its high incidence of infectious diseases, chronic diseases, limited health services and widespread poverty in many provinces. Kraft and Mehta spoke about post-Ebola symptoms in survivors — including joint disease, hair loss, fatigue and weakness, and hearing and vision problems. “I have heard about this with survivors in the Congo as well,” Mutombo said. As the tour concluded, all agreed to keep each other abreast of their efforts and to share information that might be helpful. “One of our goals is to take what we’ve learned about preventing transmission of disease in a biocontainment unit and bring that into every health care setting and interaction,” said Kraft. And active drills continue for the SCDU staff, who must constantly be prepared to reactivate the unit at a moment’s notice.